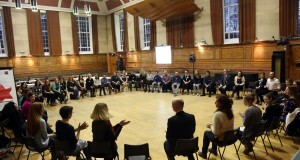 Tuesday 17 November saw this year’s Sound Connections Challenging Circumstances Music Network (CCMN) conference, held in partnership with English Folk Dance and Song Society (EFDSS) at the beautiful Cecil Sharp House. The day began with an inspirational keynote presentation and group activity from Stella Barnes, Director of Participation at Ovalhouse, where she leads on a Young Associates programme. Stella’s session was entitled “Ethics in participatory arts – why we need it more than ever”, and during the activity, delegates were asked to discuss what ethical values they consider to be important in their work with young people, and were encouraged to be honest about what more they could do. Click here to read our delegates’ ethical pledges. Sound Connections Programme Manager, Jenn Raven, and Co-founder of Fairbeats!, Catherine Carter, led the next session on Taking Off – Sound Connections research project which aims to map musical activity and progression routes specifically for young Londoners facing challenging life circumstances. Key findings from the surveying, mapping and scoping were shared, along with some recommendations for the sector with regards to how we can better support young people who face barriers to accessing music activity, and work towards joining up the excellent work we’ve profiled over the course of our research. A detailed report on Taking Off – and the official launch of the microsite – is to be published soon. Watch this space! International music education exchanges – Jim Pinchen, Surrey Music Hub. Click here to download Jim’s PowerPoint slides. The musical progression support worker – Hermione Jones, Irene Taylor Trust. Click here to download Hermione’s workshop handout. Music making with SEND young people – Graham Dowdall, freelance music practitioner. Songwriting in detention settings – John Speyer, Music in Detention. “Should disabled musicians bother with accreditation and assessment?” – Jonathan Westrup – SEND Music Education Manager, Drake Music. Click here to download Jonathan’s notes. “How do we prepare our young people for the harsh realities of an elitist system and equip them with the tools to progress through it?” – Adem Holness – emerging artist (Pocketclub) and Wired4Music researcher & member. Click here to download Adem’s solution group notes. “What happens when the barrier to musical progression you can’t overcome is parental apathy and lack of support?” – Amy Haynes – Director of Music, Lister Community School. Click here to download Amy’s solution group notes. “What are inclusive and socially just approaches to music education and how might we promote them in our music teaching and leading?” – Gary Spruce – Senior Lecturer in Education, The Open University. Click here to download Gary’s solution group notes. The day was beautifully wrapped up by folk musician and workshop leader Ruairi Glasheen, who led our delegates in an inclusive musical moment and left us all on a high! The Sound Connections team are grateful to all of our fantastic contributors – with special thanks to Marion Friend and our own Nicky Dewar, who ran coaching sessions and Innovate funding surgeries throughout the afternoon – and to the amazing EFDSS team at Cecil Sharp House for looking after us all so brilliantly. To view a summary of the day made up of Tweets and photos, click here to read our Storify.